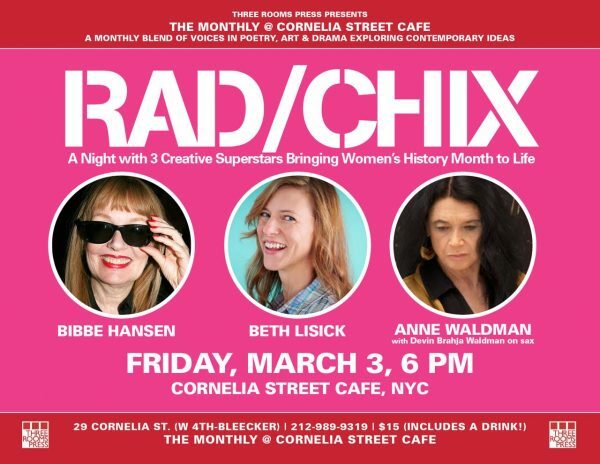 Rad/Chix brings together Warhol superstar/performance artist Bibbe Hansen, NY Times Bestselling author and actor Beth Lisick, and internationally acclaimed poet Anne Waldman for a night of brilliant readings, storytelling, and performances. These legendary ladies are teaming up in a celebration of Women’s History Month for Three Room’s Press’ latest installment of The Monthly at Cornelia Street Cafe on Friday, March 3rd at 6pm. Admission is $15, which includes a free drink. For more information and reservations, email info@threeroomspress.com. Bibbe Hansen is a performance artist, actress and musician. She is the daughter of Fluxus artist Al Hansen, and the mother of artist Channing Hansen and the pop musician Beck. A longtime participant in avant-garde, contemporary art communities, as a youngster Bibbe made films with Andy Warhol and Jonas Mekas and released a pop record with Jan Kerouac. Currently a member of the virtual reality performance group Second Front, Hansen is writing a memoir, and she teaches and lectures on art and the creative process. Bibbe is represented by Gracie Mansion Gallery in New York. Beth Lisick is a writer and actor. She is the author of five books and has appeared in films screened at Cannes, Sundance, and the San Francisco International Film Festival. Her books include the memoir collection Yokohama Threeway and Other Small Shames, the New York Times bestselling comic memoir Everybody Into the Pool, the gonzo self-help manifesto Helping Me Help Myself, the story collection This Too Can Be Yours, and the performance poetry/story collection Monkey Girl. Anne Waldman is an internationally recognized and acclaimed poet and has been an active member of the “Outrider” experimental poetry community, a culture she has helped create and nurture for over four decades as writer, editor, teacher, performer, magpie scholar, infra-structure curator, and cultural/political activist. Her poetry is recognized in the lineage of Whitman and Ginsberg, and in the Beat, New York School, and Black Mountain trajectories of the New American Poetry. But has raised the bar as a feminist, activist and powerful performer. She has read in the streets as well as numerous larger venues such as the Dodge Literary Festival in the USA and the Jaipur Literature Festival in India and continues to teach poetics all over the world.